Let's try to extract some data from the e-commerce giant, Amazon. 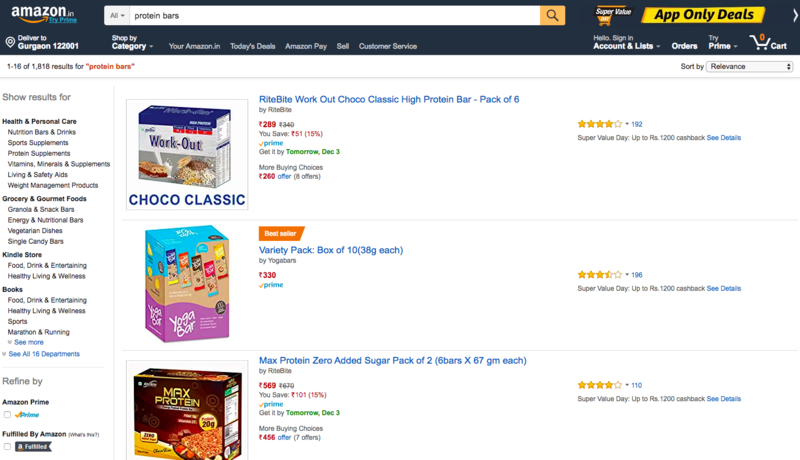 Let's search for "Protien Bars" and related products, and then we will scrape data from the search results that we get. Above we have a screenshot of the webpage, with the search results. Now the first step will be to indentify the HTML tag which holds the data that we want to scrape. So, inside span tag we have to look for class attribute with value a-size-base a-color-price a-text-bold. Now, let's code write the program/script for extracting the data. Covering all the technicalities and features of BeautifulSoup module in a single tutorial is impossible. So, we will recommend you to read official documentation here. Note: Here you might get confused as the price of some products are not getting displayed correctly. This is because the class name which we have used here for price extraction is different for some items(which are in offer). So you need to change the class name for such items. So now you know how to scrape data from any website. Although BeautifulSoup module does provide a lot of other functionalities too, but using the above script/program, you can easily scrape data from any website. Remember the 2 steps: Identify the HTML tag and then use the program to scrape.